Let’s start fixing some of the mess! 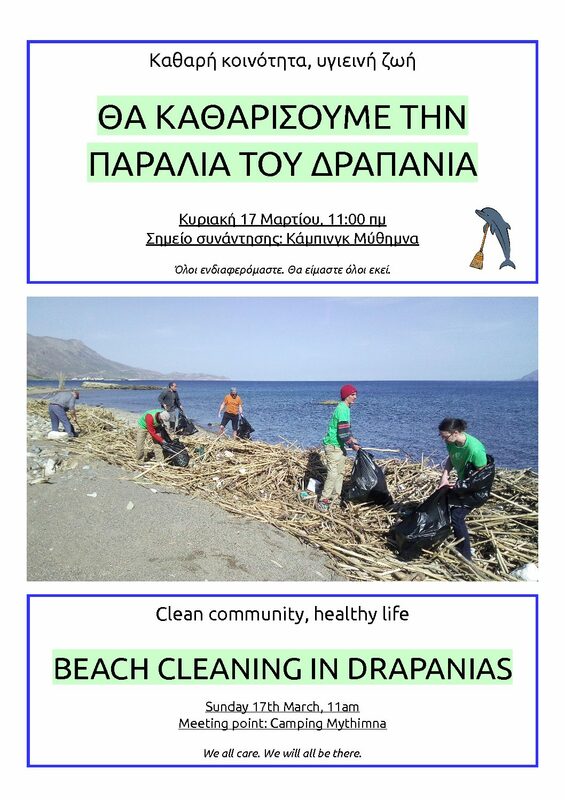 Beach cleaning in Drapanias beach. Sunday morning 11am, 17th March. Bags and gloves will be provided by the Municipality of Kissamos. There are tons of rubbish all over the place, but all together we can make a difference. The Municipality is also sending municipal cleaners to clean the beaches these days, but they need help, there is too much rubbish. We are organising to have rubbish trucks come and collect the bags directly on the day. I will come on sunday. We have 100 bin bags and two boxes of gloves courtesy of the Municipality. I met some people in Drapanias today who said they would come with tractors to help remove the full bags. The beach is still full of rubbish mixed with big bamboo piles. It won’t be super easy to work through it, but any plastic that we manage to remove from the beach will be good. Camping Mythimna will offer some light refreshments afterwards, snacks and drinks. I sent some info and a poster about tomorrow to local newspapers and news outlets a few days ago, I know that some (Sadentrepese, Biskotto, Haniotika Nea) picked it up and published it. We also put up some posters around Kastelli and Drapanias. Word must have gotten around, maybe it’s not the largest sample but everyone I talked to these days knew about it and expressed their support. We have everyone’s support, let’s hope the turn up will be good too. In any case we are sending the right message. A great effort this morning! We collected a literal mountain of rubbish, and I estimate we had something like 80 people (or maybe more?) picking up rubbish, between our long standing beach cleaners, people from the village and even young girls from the local high school. We managed to clean a long stretch of beach and certainly left an impression. In a sense we only really scratched the surface, but it was an itch worth scratching! The consciences are awakening. And here’s a photo of a small fraction of Drapanias beach being cleaned by a small part of the total participants.